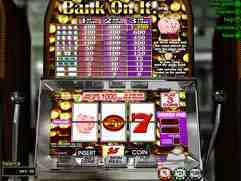 One of Real Time Gamings classic three reel slots. The Bank on It slot has a piggy bank theme running throughout and a basic piggy bank type feature where you can win a minimum of 150 coins. I've won more on this slot than I have won on any other slot ever - K.M. Not bad if you like old style machines - Jack T.